This post was created in partnership with Behr who provided paint we love! Happy Tuesday, friends! Last week was a little bit of a quiet week for us here on the blog because I was laid up with a little cold that took me down... hard... for a couple of days, but with a lot of rest and a slightly disturbing amount of Vitamin C, we're back in action this week bringing you a little bit of budget-friendly home decor inspiration in partnership with our friends over at Behr! This project has been on our minds and on our schedule for so long, but it took us quite a bit of time to figure out how to accomplish this project in the most budget friendly way possible. We've wanted to place Adirondack chairs on our front "patio" for about two years now, and just hadn't pulled the trigger because frankly, Adirondack chairs used to be really expensive no matter where you looked. 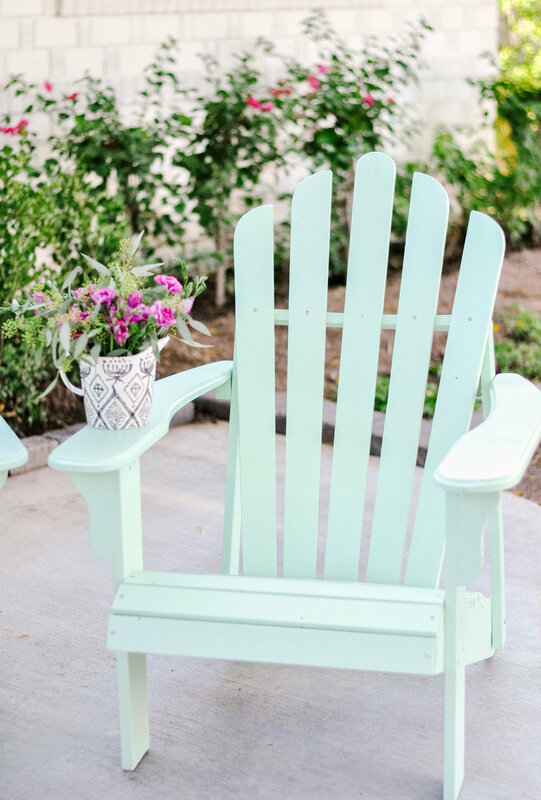 And it's not that we weren't willing to invest in these pieces, but the fact that we were also constantly investing in other home improvement projects coupled with the fact that we were searching for the perfect color of seafoam Adirondack chairs made it a pretty challenging pursuit. For so long all we could find were chairs that were $200 and up... a piece. Which isn't exactly the end of the world, but it just didn't feel like the answer. Are we the only ones who really don't love spending money on items that we don't feel awesome about? But after searching and searching for just the right thing, something magical happened. Well a couple of magical things. First, prices for wood Adirondack chairs in general slowly started to drop and then we found these $47 unfinished wood Adirondack chairs on Hayneedle and we realized that (lightbulb) we could paint these budget-friendly Adirondack chairs ourselves with whatever exterior paint color was the perfect shade of seafoam for us, and BAM! 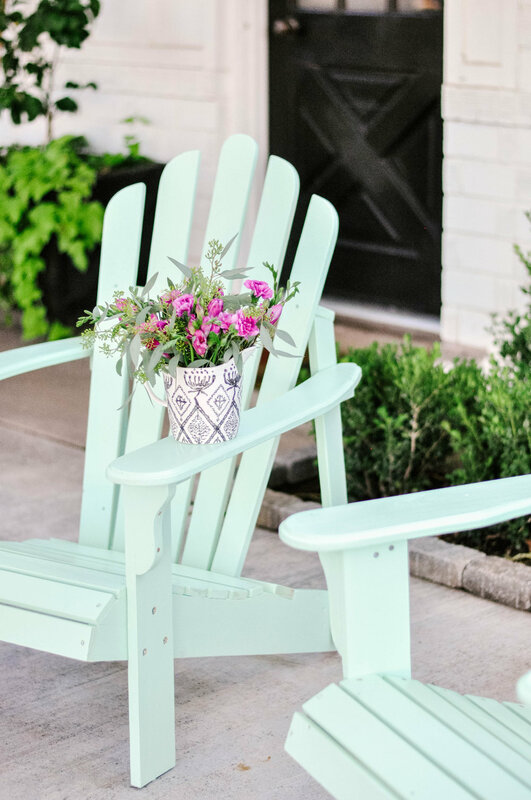 We'd have two perfectly painted seafoam Adirondack chairs on our front patio for sunset porch sittin' and sippin' without breaking the bank. And that we felt really good about. We were lucky enough to team up with the paint experts at Behr, a paint brand that has steadfastly seen us through many a successful DIY project, and found the perfect shade of seafoam to match all of our other seafoam decor items like our beloved pendant barn light in our breakfast nook from Barn Light Electric (in "Jadite") and this pretty patterned pillow from Lulu & Georgia. Cohesive. And we just love cohesion, especially where our love of seafoam is concerned. For our perfect shade of seafoam, the hue couldn't be too minty or too turquoise. It had to have enough green tones in it to feel slightly warm, but not too warm. And it couldn't be too blue. We know... it's a lot. And after comparing and testing five different seafoam hues from Behr, we immediately knew that it had to be "Enchanted Meadow". See all of the colors we tested below! 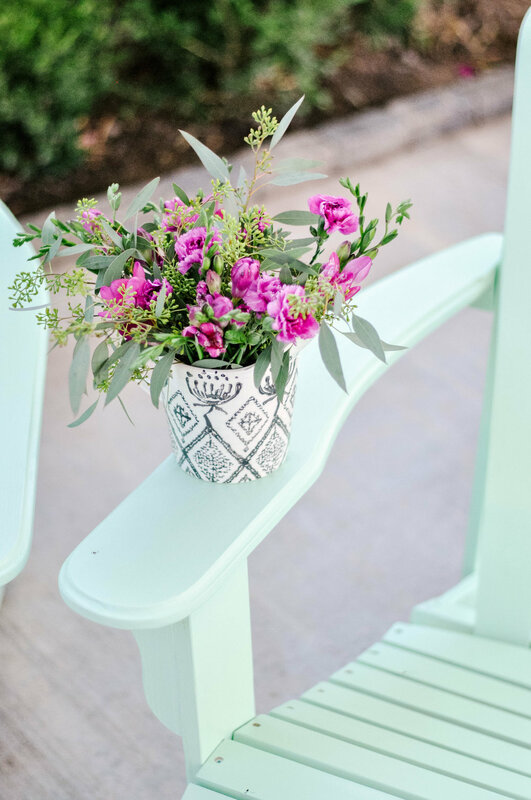 "Enchanted Meadow" is the perfect rich, milky, not-too-minty hue that all our seafoam dreams are made of and even more excitingly, we think it looks even prettier on the chairs than it did on our test board. What's more, we decided to use the Behr Marquee Exterior paint + primer in one in a satin finish because when it comes to standing up to the elements, this stuff is the best of the best. Another major perk? It gives you complete coverage in just one coat, so you don't have to spend hours and hours slaving away and applying multiple coats to get perfect coverage. If you've painted furniture before, you know how awesome that is! 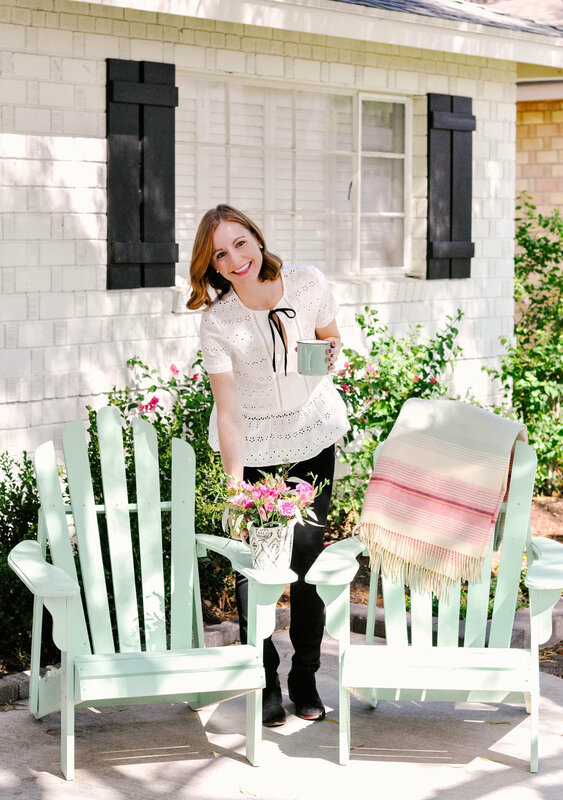 I know that I probably don't even need to tell you guys this, but a superior exterior paint formula is everything when it comes to painting outdoor furniture pieces, especially in Arizona. We had to learn that lesson the hard way, friends and let's just say it wasn't pretty. So admittedly, this was one of the easiest and most straight forward DIY projects we've ever tackled, but the reason this project was still one of our most exciting yet is because we found an awesomely affordable way to get the two beautiful wood Adirondack chairs we had wanted for so long in the exact color we wanted. And we didn't sacrifice quality at all in the process. Success! See the complete How To below. 1. 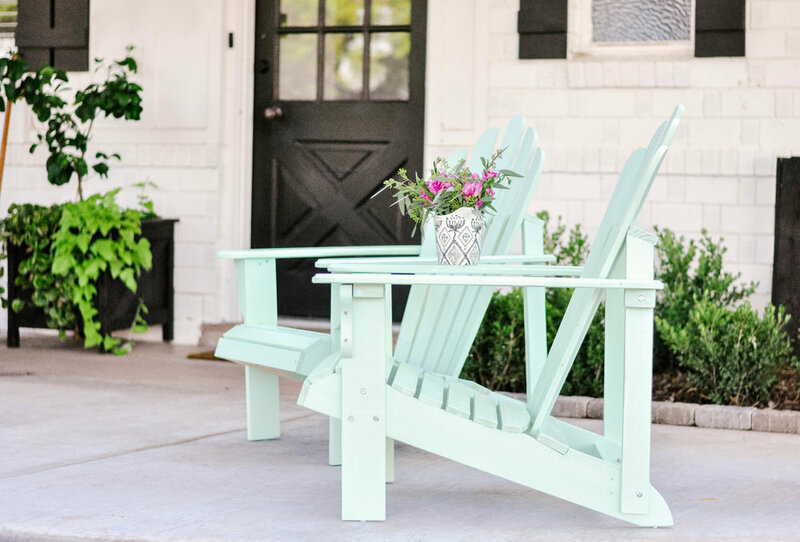 These particular Adirondack chairs required some easy assembly, so it arrived in several pieces which was perfect for this project because I could paint the pieces perfectly and easily before assembling (that's so much easier than painting after assembly). I lightly sanded a few areas of the pieces that were slightly rough with an all-purpose sanding block, but that's all the sanding that was really needed on these. Yay! 2. Paint one side of each piece thoroughly, following the direction of the grain of the wood with your brushstrokes. Allow each piece to dry. 3. Flip each chair piece over and paint the other side of each piece. Allow each piece to dry. 4. As mentioned, the particular paint from Behr that we used allows for even, one-coat coverage. Which is awesome! But if you feel you need to have more coverage in certain spots, simply repeat steps two and three when applying a second coat. 5. This paint dries completely relatively quickly. After about two hours the paint was completely dry on all chair pieces and we were ready to assemble. Assemble your chair per your manufacturer's instructions. These particular chairs were assembled in four simple steps. To speed the process up a bit, we used a power drill instead of the recommended screwdriver because... power tools, people.